In the case of soil measurement, the pH value may vary depending on the amount of the soil sampled, the amount of pure water, stirring time, exposure time. 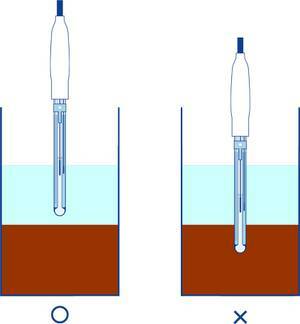 Always measure the pH value with a constant amount of the soil and under the same condition. When perform the measurement, exercise the caution regarding the following items. When perform the measurement, keep the temperature of the supernatant constant. Securely avoid that the liquid junction of the sensing part and the reference part from being immersed in the soil precipitation part. In the pH measurement of the soil which includes many salts, measuring the level of potential acidity is better to obtain the value with smaller error. However, the values between the level of the potential acidity are extremely different. Therefore, unify the methods into either of them to compare some samples. Put 10 g of air-dried fine earth on top of 50 mL beaker, add 25 mL of pure water, stir it 4 times in every 30 minutes, leave it alone for an hour, then perform the measurement after immersed the electrode in the supernatant. *The pH value measured by the method mentioned above is called the level of active acidity pH (H2O). On the other hand, the pH value measured from the supernatant after adding the 1 mol/L KCl (75g of KCl/pure water) instead of pure water into the fine earth is called the level of potential acidity (pH (KCl)).